Ever had a nightmare? Now imagine being trapped in a nightmare, unable to escape! That is exactly what happens to the victims of sleep paralysis, the focus of Rodney Ascher’s new feature documentary THE NIGHTMARE. THE NIGHTMARE follows the story of eight people who suffer from sleep paralysis, a terrifying condition in which the dreamer is locked within his or her own nightmare and is unable to wake up. The feature documentary combines real-life anecdotes from individuals who suffer from the terrifying condition with reconstructions of their nightmares. Director Rodney Ascher (ROOM 237) attempts to get under the skin of his subjects to explore the darker reaches of the human psyche. The film plays out through vivid dramatisations of dreams recounted in voice-over before building to the question of how the subjects deal with their worsening condition. As truth is often scarier than fiction, I had high expectations for THE NIGHTMARE but have to admit that I was a disappointed. The interviews felt scripted and unbelievable and there is little to no scientific information on the condition to explain why it happens. After watching the trailer, I expected this documentary to really get the blood pumping and the heart pounding but it failed. I’m not sure that this documentary would scare the minority let alone the majority – not even those new to the horror genre. 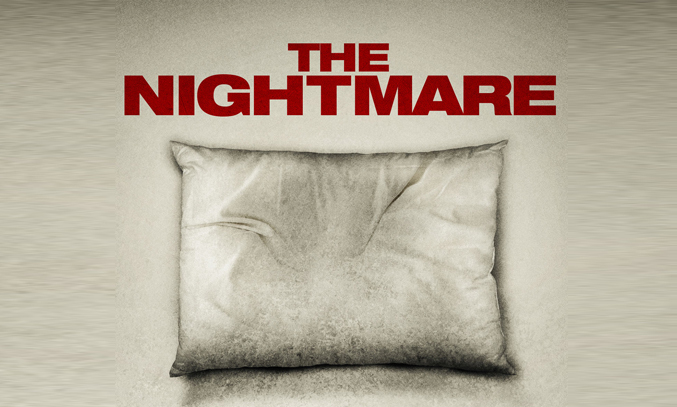 The main issue with THE NIGHTMARE is related to its layout and sequencing. Ascher flicks between subjects little and often, swiftly dramatizing their encounters before moving on. Personally, I would have preferred to follow each person in full before focusing on to the next subject as the as the constant movement between subjects makes the film loose its focus. The intentional breaking of the fourth wall is also laboured and distracting and by the end of the film, I struggled to recall any of the key features. On the plus side, the subject matter is fascinating and the cinematography and horror imagery is pretty decent. For those with a true interest in sleep paralysis, THE NIGHTMARE is worth a watch. But if you are a diehard horror fanatic looking for something new to get your heart racing, this probably isn’t the film for you. THE NIGHTMARE made its Northern Premiere at GrimmFest 2015 on 3 October. Jamie Abbott is a Manchester bus driver and SuperDad. He loves all things that remind him of being a child including comics, films and games. Only rarely does he enter the world of adulthood – writing for Frankly My Dear is one of those occasions.